Bryce Canyon National Park spans 56 square miles throughout southern Utah and is best known for its unique hoodoo rock formations, which were formed by the erosion of natural rock arches breaking apart into spires. The park was established in the 1920s to protect the park’s exceptional natural beauty and receives more than 2.3 million annual visitors. Popular landmarks within the park include its Rainbow and Yovimpa Points, which offer glimpses of the stunning Grand Staircase sediment layers, and the dormant batholithic volcano Navajo Mountain. 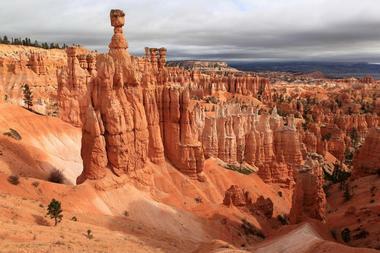 These easy overlook walks and moderate hiking trails offer up-close looks at the park’s most unique hoodoos and formations, with some offering backcountry hiking and camping opportunities for advanced hikers. 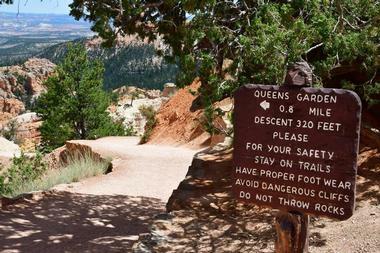 Bristlecone Loop Trail is an easy mile-long loop trail near Kanab that is recommended for hikers of all skill levels. The trail is accessible via Rainbow Point near the park’s southern end and gains an elevation of 88 feet, taking visitors to the park’s highest region, which peaks at over 9,100 feet. It traverses past historic bristlecone pine trees aged up to 1,800 years old, along with a rich blue spruce, Douglas, and white fir tree forested region. Along the way, visitors have chances to see woodpeckers, owls, ravens, Steller’s jays, and other native bird species. Visitors should note that the trail may be inaccessible between December and March due to the region’s heavy annual snowfall. 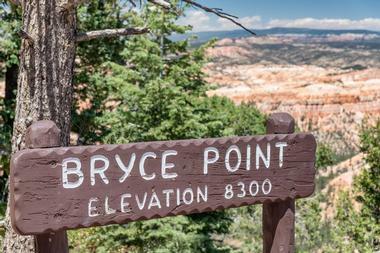 Bryce Point Trail is a heavily-traversed 0.2-mile trail that offers stunning views of the Bryce Amphitheater for hikers and tourists of all skill levels. The easy out-and-back trail is paved its entire length, offering access for families with young children in town and visitors with disabilities. Newly-installed safety fencing also provides additional comfort. The trail is used by a number of National Park-led nature trips and walks and offers chances for bird watching along the way. Visitors should note that the trail may be closed during the winter months without notice due to icy pavement conditions. Dogs are not permitted on the trail at any time. Fairyland Loop Trail is a 7.4-mile moderately difficult trail that embarks at Fairyland Point in the park’s northern end. The trail gains an elevation of 1,545 feet throughout its loop route and typically takes approximately four to five hours to complete. 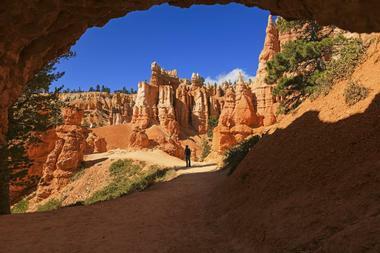 Along the way, visitors have chances to glimpse the park’s spectacular collection of hoodoo spires, which were created by the erosion and separation of natural land bridges. 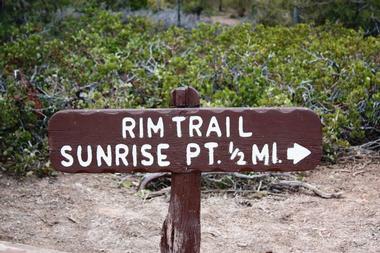 A portion of the trail combines with the nearby Rim Trail between Fairyland and Sunset Points. As one of the park’s longest individual-trail hikes, visitors are encouraged to bring water on their trips and exercise proper hiking caution throughout their trip. Hat Shop And Pink Cliffs Via Under The Rim Trail is an 11.8-mile point-to-point trail that is rated as moderately difficult and is not advised for beginner hikers due to steep descents along its route. 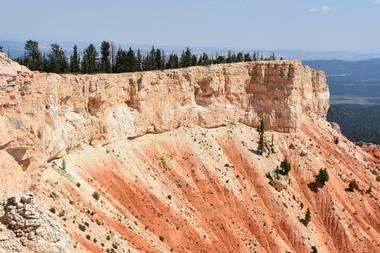 The trail begins at Bryce Point and descends more than 3,000 feet throughout its length. It traverses noted park sights such as the beautiful Hat Shop hoodoo cluster within the Pink Cliffs region of the park, offering chances to explore less-trafficked areas of the park and take in scenery without large groups of tourists around. Visitors should note that the trail’s return is mostly uphill and that its difficulty level increases significantly throughout the winter months, with foot traction devices strongly recommended for hikers still attempting the route. Inspiration To Queens Garden Using Park Trail is a 2.8-mile point-to-point trail that is a variation of the more popular Queens Garden Loop, which is often highly crowded during peak seasons. A park shuttle loads near the park’s entrance and visitor center and takes hikers to Inspiration Point, which offers a stunning scenic overlook. It then traverses toward Sunset Point along a mostly level route before passing Navajo and Queens Garden and ending back at the park’s General Store, gaining an elevation of 587 feet along the way. Views of park sights such as Silent City are offered, along with opportunities for bird and wildlife watching. Visitors can continue along the park’s scenic driving trail after returning to the parking lot to make a day out of their park exploration. Mossy Cave Turret Arch and Little Windows Trail is a 0.9-mile trail near Tropic that showcases a dolomite limestone-formed waterfall. The easy trail is recommended for hikers of all ability levels and is most accessible between March and November, though it is hikeable year-round depending on weather conditions. Its straightforward out-and-back route is perfect for travelers with children or hikers with limited exploration looking for a quick scenic trail. It also traverses sights such as Water Canyon, which was partially carved as an irrigation ditch by 19th-century Mormon pioneers, and the Mossy Cave shelter cavern and grotto, which is supplied by an underground spring. During the winter months, beautiful formations of icicles are visible overhanging the cavern. 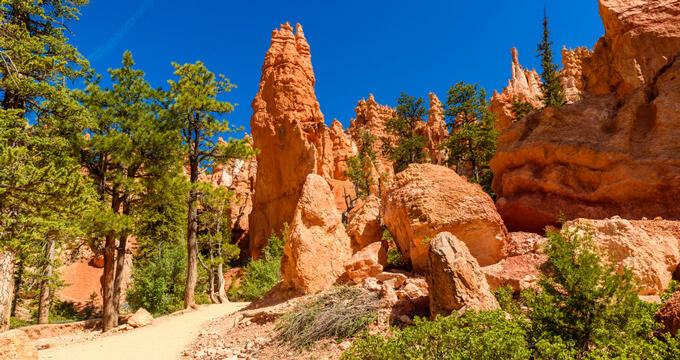 Navajo Loop and Queens Garden Trail combines the popular Queens Garden and Navajo Loop routes into a 2.9-mile hike embarking from Sunset Point. The route serves as a popular combination option to see the national park’s most spectacular sights, including Sunset Point, which serves as its trailhead. 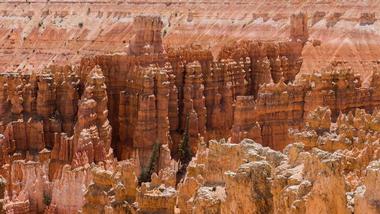 From there, it meanders through the Queens Garden Trail until it reaches a four-way intersection at the canyon’s floor. 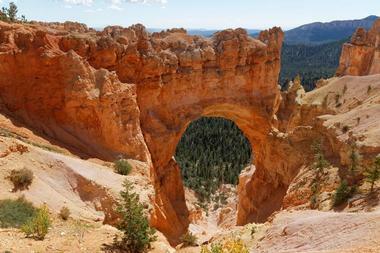 Hikers will want to continue straight at the intersection into the Navajo Loop, which showcases landmarks such as Thor’s Hammer and Two Bridges. 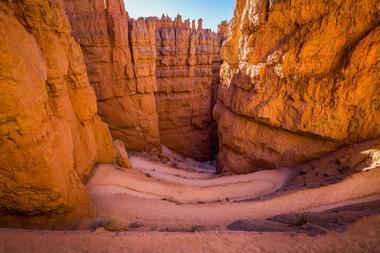 After reaching Wall Street, the park’s only slot canyon, the loop returns to Sunset Point. Navajo Loop Trail is a 1.3-mile loop route that starts at Sunset Point and descends more than 500 feet into the park’s main canyon amphitheater. The trail passes the Wall Street canyon region, which features towering fir trees along a narrow pathway between sheer cliffs, and the highly-photographed Thor’s Hammer formation. Views of sights such as Silent City and the Temple of Osiris are also offered. 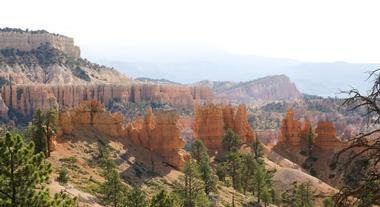 The hike takes approximately one to two hours to complete and is one of the park’s most popular visitor trails. Visitors should note that the Wall Street portion of the trail closes frequently throughout colder months due to freezing overnight temperatures. The hike is popularly combined with both the nearby Queen’s Garden Trail and Peakaboo Loop, extending the route to a length of eight miles and offering some of the most spectacular sights in the park. 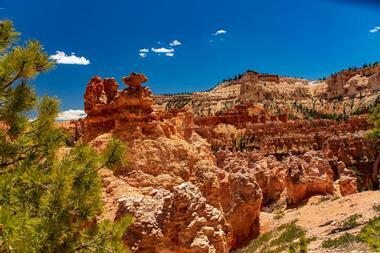 Paria Trail is a quick, easy trail offering a chance to trek out to the park’s noted Paria View overlook, which is noted as a favorite photography spot due to the fact it offers views of hoodoos facing the setting sun. The 0.3-mile hike provides opportunities to look into the Paria River watershed, which is known for its slot canyons carved by rapid runoff erosion. Peregrine falcons are often visible from the overlook, and mules, deer, and elk may be spotted along the trail. The trail gains little elevation along its route, making it an easy trek for novice hikers and visitors with children. Peekaboo Loop Trail starts at Bryce Point and descends quickly into the heart of the canyon, allowing visitors to explore the canyon’s floor directly. 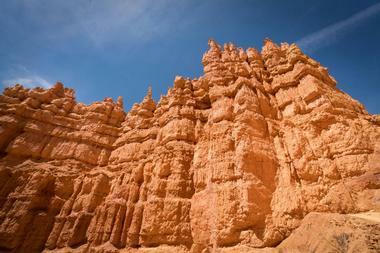 Though the 5.1-mile loop trail’s route is steep and is rated as moderately difficult, it is a popular route due to its spectacular showcase of top attractions within the Bryce Amphitheater, including the Wall of Windows. Hikers should note that the trail is also used by horse and mule riders, who should be given the right of way at all times. Due to the trail’s terrain and rapid elevation changes, hikers are advised to wear sturdy footwear, carry water and snacks, and exercise caution using the trail during the winter months. Peekaboo Loop Wall Street And Rim Trail combines three popular routes within the park for a 6.5-mile moderately strenuous out-and-back trek. 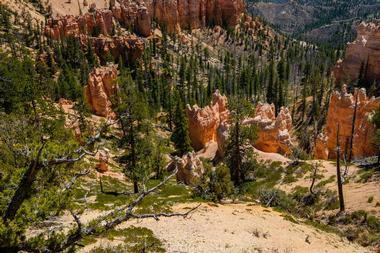 The trail explores five miles of the Peekaboo Loop Trail, which provides access to notable Bryce Amphitheater landmarks such as the Wall of Windows, a beautiful series of sandstone arches and hoodoos. From there, it connects at the Wall Street slot canyon to the Rim Trail, which provides access to Sunrise and Sunset Points. Visitors should note that the Wall Street portion of the trail closes frequently when overnight temperatures are below freezing and may be dangerous to cross during the winter months. Rainbow And Yovimpa Points Plus Bristlecone Trail is a popular combination hike that spans 1.3 miles and is recommended for hikers of all skill levels. The route connects the easy Bristlecone Loop Trail, which is accessible via Rainbow Point, to the beautiful Yovimpa Point overlook, which showcases the Grand Staircase. 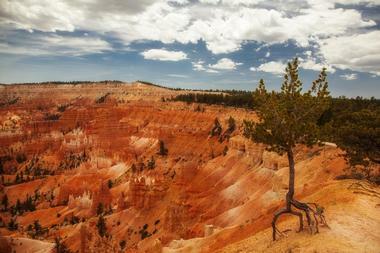 Rainbow Point is noted for its views of the Pink and Grey Cliffs of the Bryce Amphitheater and serves as a popular orientation point for visitors acquainting themselves with the geography of the canyon. The route serves as a popular wildlife watching and birding trail, particularly between March and November. Riggs Spring Loop Trail is a popular backcountry trail near Kanab that starts at Yovimpa Point, which offers spectacular views of the park’s famous Grand Staircase. 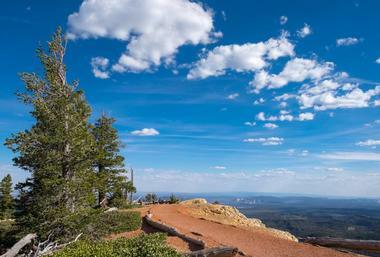 From there, the 7.9-mile trail traverses thickly forested areas showcasing bristlecone, fir, and spruce trees. Views of Quaking Aspen groves and cutaway vistas of dramatic red cliffs are visible throughout to the east and south, along with areas of abundant wildflowers. Hikers should note that the trail is a popular backcountry camping region and should be respectful of campers’ privacy. Bear spray is also strongly recommended, as are water treatment methods for hikers and campers using the trail’s natural spring as a water source. Rim Trail can be explored via two separate routes, including an easier, more level 0.9-mile portion that travels between Sunrise and Sunset Points and offers dramatic views of hoodoo structures. 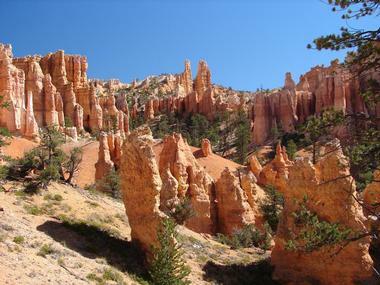 From there, the 10.7-mile round-trip trail traverses a much more difficult section between Fairyland and Bryce Points, which features elevation changes of up to 1,587 feet. Shuttle bus transportation is available during the park shuttle’s operating season at several points during the longer portion of the trail, though hikers should note that there is no official shuttle stop and will need to signal the shuttle driver to stop. Sheep Creek Swamp Canyon Trail is a loop trail that spans 4.1 miles, offering elevation changes of more than 800 feet. 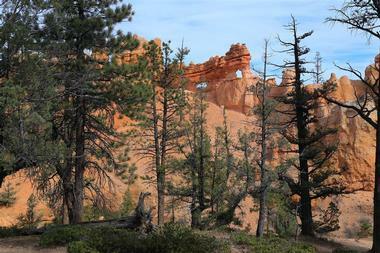 The trail traverses past an overlook over Swamp Canyon, which is surrounded by fin and hoodoo structures. Following the overlook, hikers can connect with portions of the Under the Rim Trail or make a clockwise loop that passes plenty of flowering plants during the summer months. The trail is recommended for use between April and November and is considered one of the best sites in the park to glimpse a more intimate look at canyon structures than some of its more popular massive overlook sites. Hikers should exercise caution when interacting with wildlife on the trail, which may include wasps, deer, mountain lions, and bears. Sunset Point To Sunrise Trail connects the park’s famous Sunrise and Sunset Points, two spectacular overlooks that make for fantastic photo opportunities. The 1.2-mile trail is paved throughout and is an easy route for hikers of all skill levels. Its starting point, Sunset Point, is home to some of the park’s most notable formation, including the Silent City hoodoo cluster, Thor’s Hammer, and the vibrant Claron Formation. At Sunrise Point, the Sinking Ship and the Boat Mesa are showcased, along with the Aquarius Plateau’s beautiful pink cliffs. The trail is fully wheelchair accessible at all times with the exception of some severe weather conditions and is the only trail in the park that welcomes leashed pets. Tower Bridge Trail is part of the larger Fairyland Loop Trail and offers chances to see unique white sandstone cliffs and a variety of hoodoo structures. The 3.4-mile moderate out-and-back trail is recommended for use between March and October and features elevation changes of 826 feet throughout. Its even route makes it a good choice for hikers of all abilities, including visitors with children in tow. 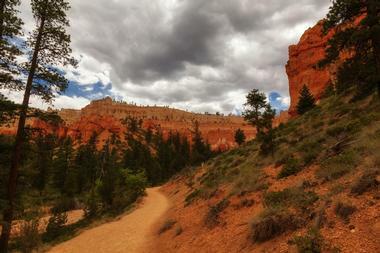 During peak seasons, the trail makes a great alternate route to the more heavily traversed Navajo Loop and Queens Garden Trail. Major sights showcased on the trail include its namesake Tower Bridge and the red sand China Wall structure. Under The Rim Trail is a 22.9-mile backcountry hiking trail that dates back to the 1930s, constructed by the Civilian Conservation Corps. In 1995, the trail was listed on the National Register of Historic Places. 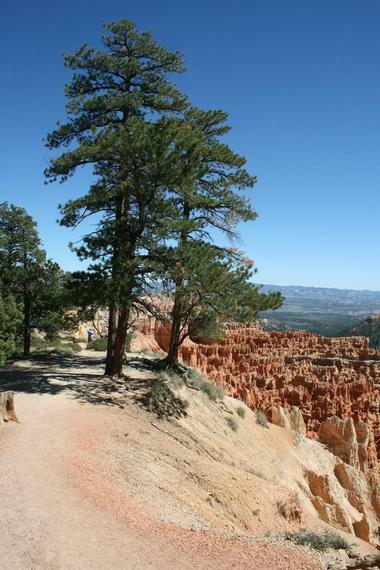 The trail provides access to the park’s Paunsaugunt Plateau region, beginning at Bryce Point and traveling east toward Rainbow Point. 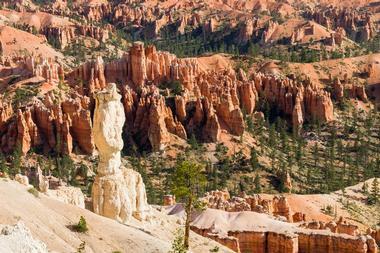 Though fewer of the park’s famous hoodoos are showcased along this trail than other park routes, it remains popular as a campsite location. Several trails connect within its larger system, including the Whiteman and Agua Canyon Connecting Trails. Hikers are asked to exercise caution with water supply and consumption, as water sources can be very hard to find and those that exist may be contaminated with E.coli. Wall Street And Queens Garden Loop Trail is a popular loop combination hiking route that spans a distance of 3.3 miles and is rated as moderately difficult. The loop is heavily trafficked during the summer months and meanders through beautiful red rock formations within the Bryce Amphitheater. It is best hiked during the summer months when the Wall Street slot canyon is fully accessible. Visitors should note that Wall Street is frequently closed during inclement weather and cold temperatures, and that the Navajo Loop and Queens Garden Trail serves as an alternate route showcasing similar park landmarks and attractions. Yovimpa Trail is a quick 0.3-mile connector trail to the park’s famous Yovimpa Point, offering an alternative to the longer Riggs Spring Loop Trail. The paved trail is recommended for hikers of all ability levels, including tourists with children in tow and visitors with disabilities. At the point, a variety of spectacular formations are showcased, including the Grand Staircase, formed during the Permian and Tertiary Eras. The 200-mile sedimentary rock layer sequence was originally mapped and named by geologist Clarence Dutton in the 1870s and contains famous sections such as the Pink and White Cliffs, which are among the park’s most notable features.